Is there a software to clone HDD to Toshiba SSD drive instead of NTI Echo data migration tool? AOMEI Backupper is the best Toshiba SSD cloning software to transfer data in Windows 10/8/7. With the progress and development of science and technology, solid state disk (SSD) is the best option for computer hard disk upgrade. 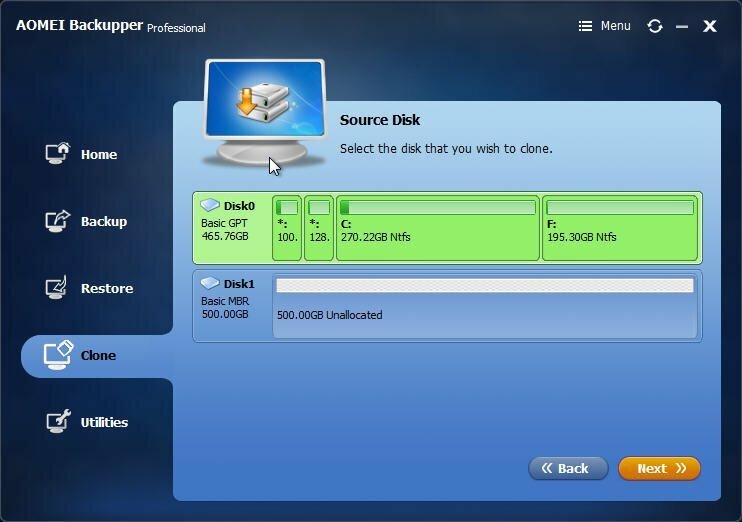 Usually, SSD disk is used to promote the performance of a computer as boot hard drive or secondary storage device. Toshiba SSD is a popular brand of hard disk. As we all known, hard disk manufacturers provides the specialized cloning software in most cases, as well as Toshiba. You can get the cloning software on their website or on a CD/DVD comes with the hard disk. Toshiba SSD is a reliable and secure hard disk to use, and provides a copy of NTI Echo to migrate data to Toshiba SSD drive. NTI Echo is migration software for Toshiba SSD or HDD, provides services under Windows Vista/XP/7/8/8.1/10. However, this Toshiba SSD cloning software doesn't support other manufacturer's drives. For most of users, it’s kind of disappointed. Besides, there are some complain in the forums. The NTI Echo cloning tool has some problems to clone the hard drive after upgrade Windows 8 to Windows 8.1, try to repair this issue but still cannot transfer the data of hard disk; or something like that: the cloning process stopped when I clone Windows 10 to my Toshiba SSD, I have to restart my computer, but it just can’t restart with a message stating “NTI is starting, bla bla bla…”, after this, it tried to restart again, and again and again. That is to say, the cloning process corrupted the normal boot. The good news is you can use the third party Toshiba SSD cloning software to clone data to Toshiba SSD drive. It’s more flexible and easy to clone data than Toshiba specialized migration tool. AOMEI Backupper is professional data migration software, and strongly recommended by most of users because of its powerful cloning functions and data restore features. AOMEI Bakcupper supports the Windows Operating system, including Windows Vista/XP/7/8/8.1/10 (all editions, 32 bit & 64 bit). This Toshiba SSD migration tool - AOMEI Backupper can make you cloning easily. 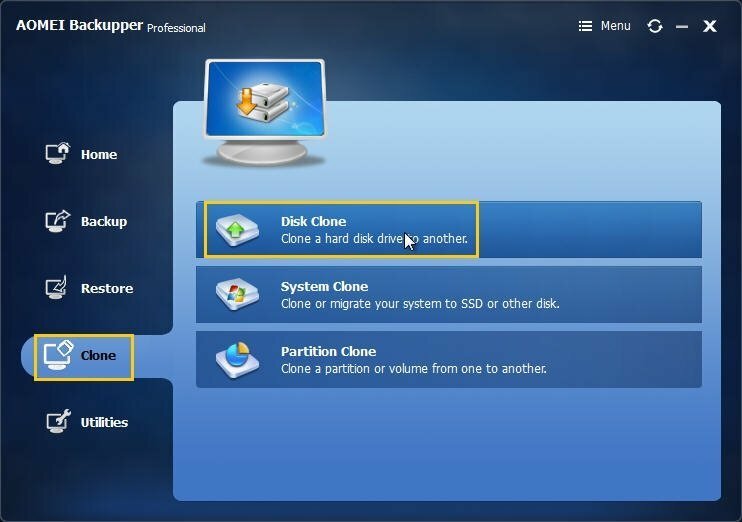 Step 1: Install and launch AOMEI Backupper, select “Clone” on the left side panel of the main window, then click “Disk Clone”. Step 2: Select a hard drive as source disk to clone. Then hit “Next>>” to continue. Step 3: Choose Toshiba SSD drive as destination disk to save the data of source disk, and then press “Next>>”. Tips: In the step 3, ensure your Toshiba SSD can accept the data of source disk. Step 4: Preview the result of operations in the “Operation Summary” window, click “Start Clone” to migrate data to Toshiba SSD. Tick “Sector by sector clone” to copy all the sectors on source disk whether the sector is in use or not. Thus, make sure the space on Toshiba SSD drive is larger than the capacity of source disk, at least equal to the latter. Please make in mind the time it takes will be much longer. 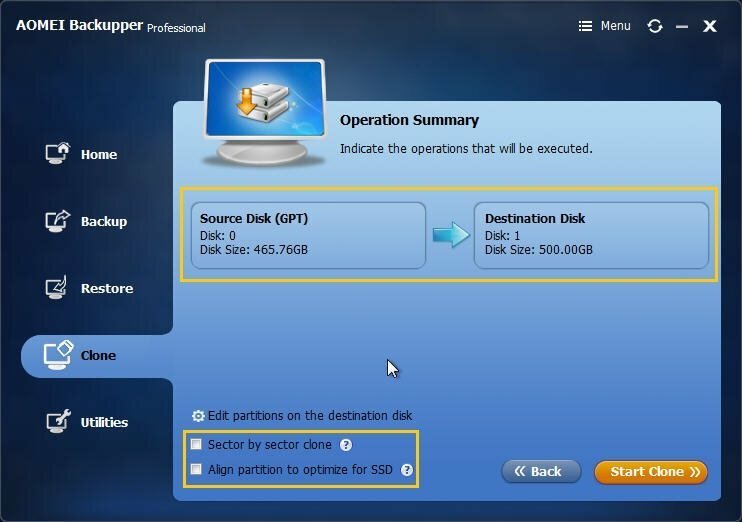 In this step, if your destination hard disk is an SSD, please tick “Align partition to optimize for SSD” option. Finally, you have transferred data from HDD to Toshiba SSD successfully with Toshiba SSD cloning software. If the source disk you cloned is the boot hard drive on your computer, you should set the Toshiba SSD drive as first boot device in BIOS after cloning operation. In addition, AOMEI Bakcupper also offers the service of system backup to restore system when the computer Operating System corrupted.